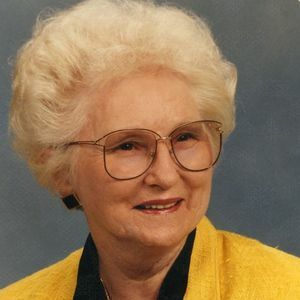 Fleta Harrelson, 93, of Elizabethtown, passed away peacefully on Friday, January 18, 2019. Fleta was born in the White's Creek Community on May 16, 1925 to Thomas Boston Harrelson and Delphia White Harrelson. She graduated from Elizabethtown High School as Salutatorian in 1943 and then attended Flora MacDonald College in Red Springs, NC, where she earned a Bachelor's Degree in Home Economics. After teaching in Fairmont Schools for several years, Fleta returned to the Elizabethtown area to help tend to her mother who had suffered a paralyzing stroke. Establishing herself in Elizabethtown, Fleta served the citizens of Bladen County as a beloved home extension agent for many years and then returned to school at North Carolina State University to pursue a Master's Degree in Foods and Nutrition. She applied the knowledge gained from her studies to her new work in the Expanded Foods and Nutrition Program (EFNEP) and retired as the area EFNEP agent in the mid 1980's. There are likely many who still remember Fleta's columns in the Bladen Journal and her radio show in the 60's cleverly titled "Home Echos." More than anything, Fleta relished the hours spent at Whitebrook Farm decorating, cooking, working in the yard and learning all the skills that would eventually determine her life's work. As anyone who ever visited Fleta at her home in Elizabethtown or at the Harrelson Homeplace can attest, Fleta loved to cook and, indeed, cooking was one of her ways to show love. Fleta was also a long-time member of Elizabethtown Baptist Church where she served as pianist for many years and attended as long as her health permitted. Through her southern grace, hospitality, and encouragement, Fleta blessed several generations of North Carolina Citizens. She will be missed by many. Fleta is predeceased by her parents; sister, Elma Harrelson Regan and cousin "brother", Milton White. Survivors include niece, Elaine Regan Steinbeck and husband, Steve Steinbeck of New Bern, NC; nephew, Robert Regan and wife Heidi Dixner of Nashville, TN; great nephew, Joey Steinbeck (Sasha); great niece, Svea Dixner-Regan and great, great niece, Logan Steinbeck along with many special family members. The family will receive friends on Wednesday, January 23rd at 1pm in the fellowship hall of Elizabethtown Baptist Church. Funeral services will follow in the sanctuary at 2pm officiated by Dr. Charles Royal, Dr. Jerry Wallace and Rev. Kincy Barrow. Burial services will be conducted in the White's Creek Baptist Church Cemetery. At all other times, the family will also receive friends at Whitebrook Farm 1377 Harrelson Road Clarkton, NC. In lieu of flowers, donations may be made to: Baptist Children Homes of North Carolina PO Box 338 Thomasville, NC 27361, Elizabethtown Baptist Church 1800 West Broad Street Elizabethtown, NC 28337, or Lower Cape Fear Hospice 206 Warrior Trail Whiteville, NC 28472. Add your thoughts, prayers or a condolence to Fleta's guestbook.